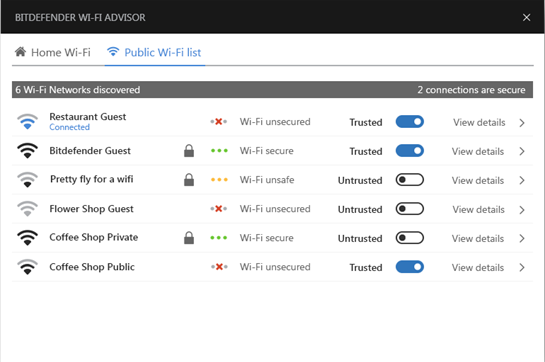 Antivirus and firewalls can't protect users from all threats inherent to shared networks, like public hotspots in parks and cafes or Wi-Fi networks in hotels and airports. The use of HTTPS isn't completely reliable and still offers hackers the possibility to perform attacks via fake websites. For this reasons, data transmitted on an open wireless connection is not fully safeguarded. 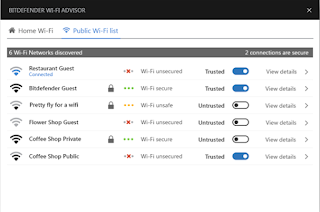 Mixed with a high risk behavior of users that perform sensitive transactions, the Wi-Fi connectivity may deeply influence the security context of their devices. 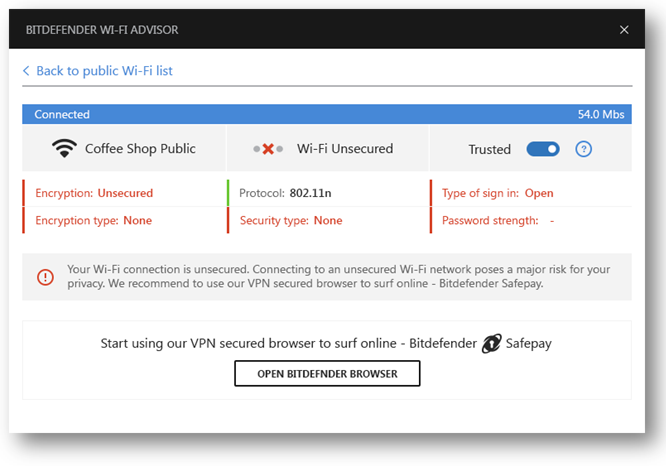 Bitdefender Wi-Fi Security Advisor makes the protection configuration of the product to be more suited to the security context of the device and offer a more comprehending protection status to the user. 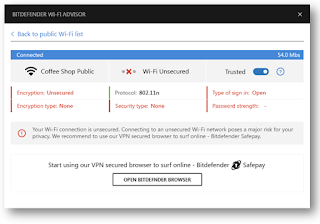 When browsing connected to an open Wi-Fi hotspot or an unsafe public Wi-Fi network, users are recommended to safely browse online with Bitdefender Safepay secure browser with active Wi-Fi Hotspot protection.